Living Well Foundation (a 501 c 3 nonprofit organization) operates the Living Well Village--a camp facility for health and wellness programs. 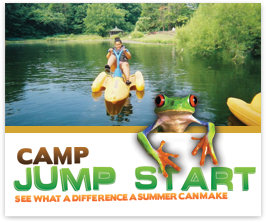 Our main program is Camp Jump Start®---a whole health camp that jumpstarts success. We address and transform the whole health of every participant - physical, emotional and social. Our participants accomplish results they never thought possible and receive a second chance to live a healthy, happy and hopeful life. They leave camp with the confidence and skills to continue their success at home.